Supplied complete with OCSB digital remote controls, water dosing bowl. 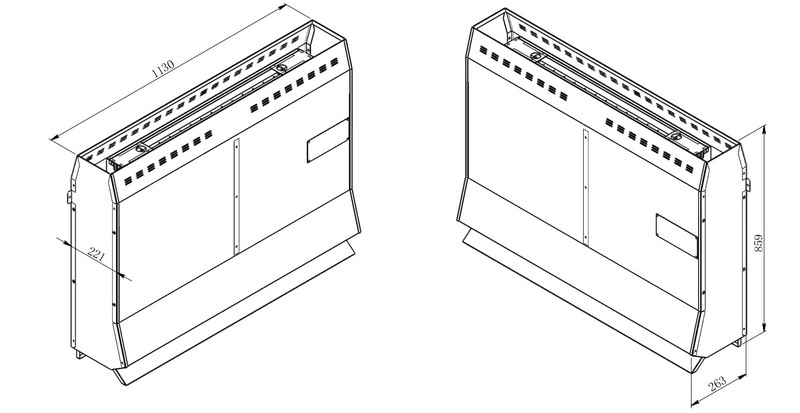 The Oceanic 9Kw behind bench sauna heater is extra robust and has been built for long day heavy duty operation, it is suitable for use in sauna cabins 14-18 cubic meters in size, to calculate the size of your cabin in cubic meters multiply the 'hight x width x length'. Although these sauna heaters are popular for professional use, many domestic customers install them due to their safety aspects. All behind bench sauna heaters are supplied complete with OCSB Digital remote controls, a water dosing bowl, and 15kg of sauna heater rocks. Safer bather environment because the heater is hidden behind a false wall preventing accidential injuries. There are many advantages of this model of heater, for full details of these please see the features tab below. We also recommend using a heat proof board around and above the sauna heater to protect the timber, this can also be purchased from us in 1200 x 1200mm boards. 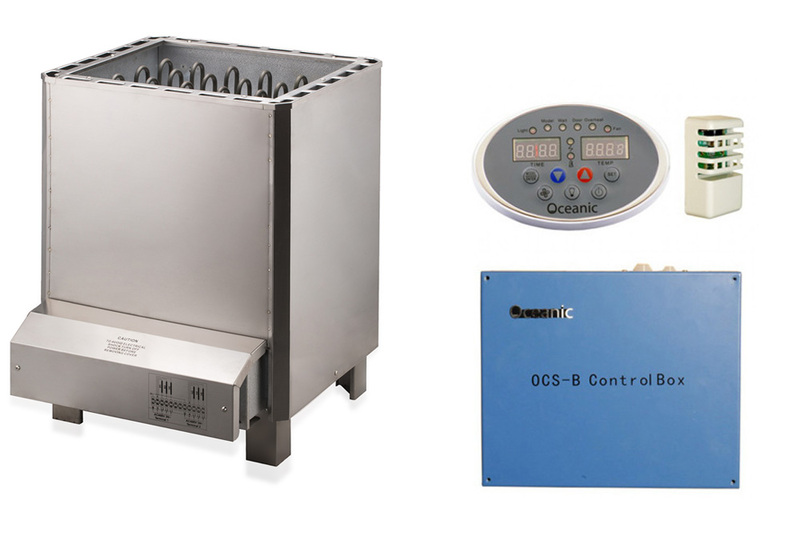 Oceanic Floor Standing heater with OCS-B controls is available in 3 sizes: 9kw, 12kw and 15kw, low votage control panel and high voltage control box. Must be wired three phase. Drip and eveporation trays control the water dosing. This prevents water being splashed directly onto the elements which is a common cause of element failure in standard sauna heaters. 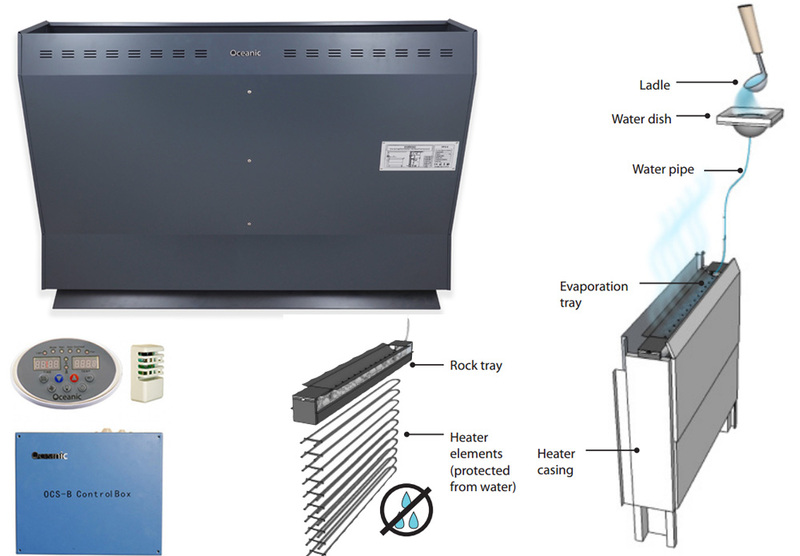 A water dish and hose are fitted with the behind bench heater, users pour water into this dish mounted behind the false wall and the water is distributed evenly across the rocks. Sauna heaters do not operate from a 3 pin plug, they require hard wiring via an isolator switch using high temperature silicon rubber cable to BSEN 6141 (not included). Purchase 3 Meters as an optional extra or See our sauna accessories page for Silicone Rubber Cable in order to order different lengths. For sauna heaters with Remote OCSB controls, the control box will supply the heater, keypad, lights and temperature sensor. The control box is usually positioned on the roof of the sauna but can also be positioned in a plant room for commercial establishments.